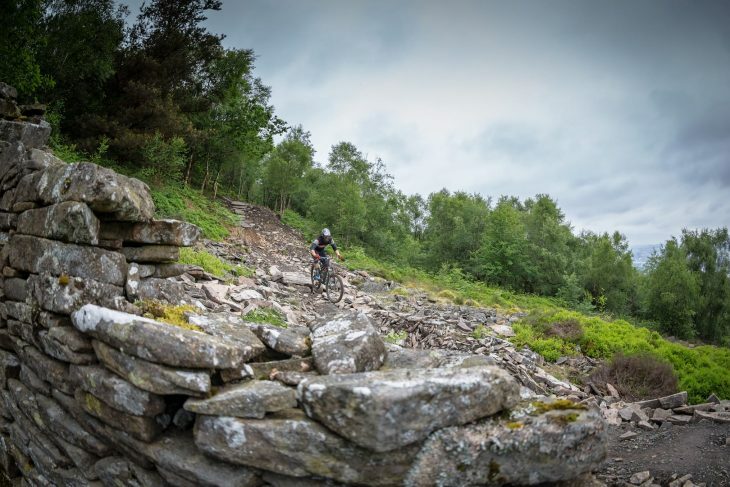 I was recently invited down to BikePark Wales for a couple of days to check out some new tyres and rims from WTB (I’ll try not to let it influence things too much that the launch was moved from Morzine at the last minute due to lingering snow in the alps). WTB has updated the Vigilante tyre with new 2.5in and 2.6in options. First on the list is a new and improved Vigilante tyre. The original Vigilante has been popular for years as a solid and dependable all rounder (albeit a relatively narrow one at only 2.3in wide). 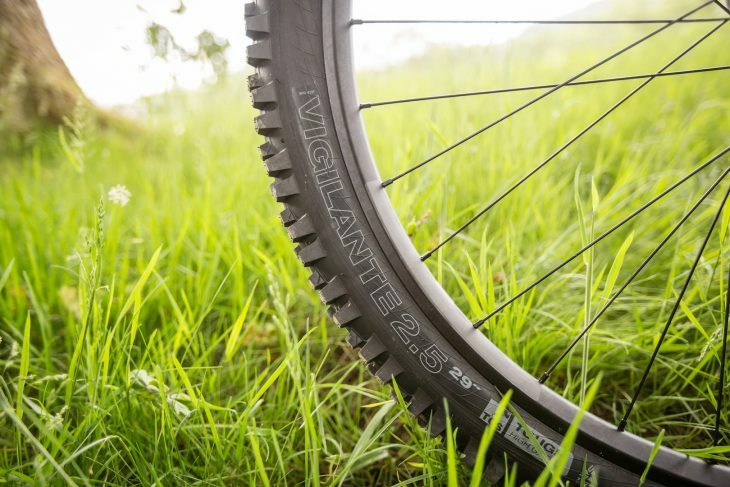 The new Vigilante addresses this, and is now available in almost-plus 2.5in and 2.6in widths, while being optimised to work with 29mm wide rims. The tread pattern is broadly the same as before, but the knobs (especially those on the shoulder) are noticeably taller for extra grip in loose conditions, while the centre knobs are spaced out slightly wider to allow the tread to remain clear in wet conditions. The sipes are all new too, placing more emphasis on cornering than outright traction. The tread pattern has changed too, and it’s purpose-built as an aggressive front tyre. Also changed is the overall purpose – the new Vigilante is very much a front specific tyre, designed to be paired with a Trail Boss out back in drier conditions, or the brand new Judge for when it’s looser (but more on those later). The Vigilante is available in 27.5in and 29in diameters, with both Light and Tough casing options, and with the new and improved TriTec Fast Rolling or High Grip triple compounds. The faster rolling Trail Boss is ideally suited for drier conditions as a rear tyre. Another tyre that’s been around for a while in the WTB lineup is the Trail Boss. Receiving a hefty update for 2018, the latest Trail Boss is designed as a rear specific tyre for drier conditions, to be paired with the Vigilante up front. Again, it’s been fattened up and is now available in 2.4in and 2.6in sizes, which are ideally paired to a rim with a 29mm internal width. Conveniently, WTB makes rims with exactly that width. 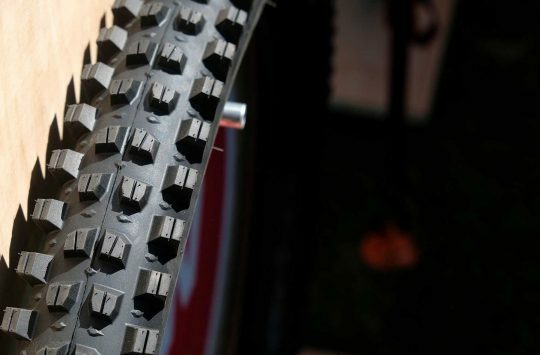 The tread pattern stays much the same, but the block height has increased for more cornering bite. The knobs are all 1mm taller for extra grip, and the outer knobs have been beefed up to avoid tyre squirm that could result from the extra height. Like the Vigilante, the tread pattern is also more open, and the outer and inner knobs have been staggered to avoid a knob free channel, in order to prevent the tyre from sliding out when cornering. It’s available for 27.5in and 29in wheels, in Light and Tough casings, but as a reflection of its rear specific status, you can only get this one in the Fast Rolling compound. The Judge is an all-new aggressive rear tyre for sloppy and/or loose conditions. Brand new for 2018, the Judge is a super burly rear-specific tyre, designed for the rowdiest and loosest enduro and gravity conditions you can think of. Huge, widely spaced centre knobs provide traction and braking control in spades, while some seriously chunky side knobs keep you pointing in the right direction. 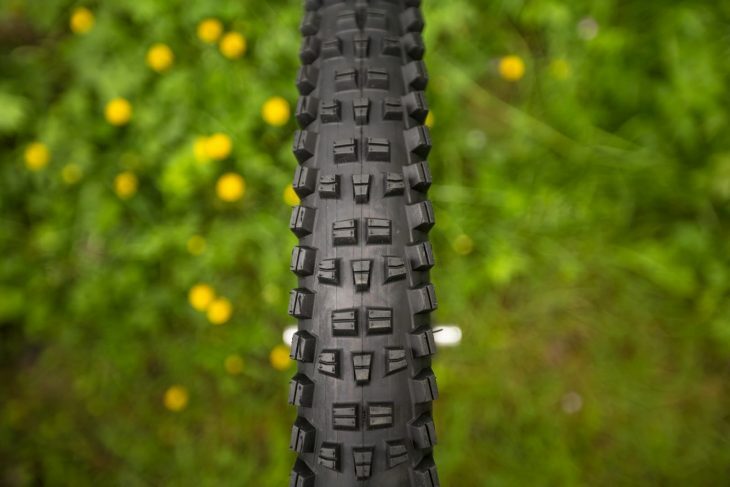 There’s a bit of a Minion DHR II vibe about the tread pattern on the new WTB Judge tyre. Optimized around 29mm rims, the Judge is available in just one width – 2.4in. 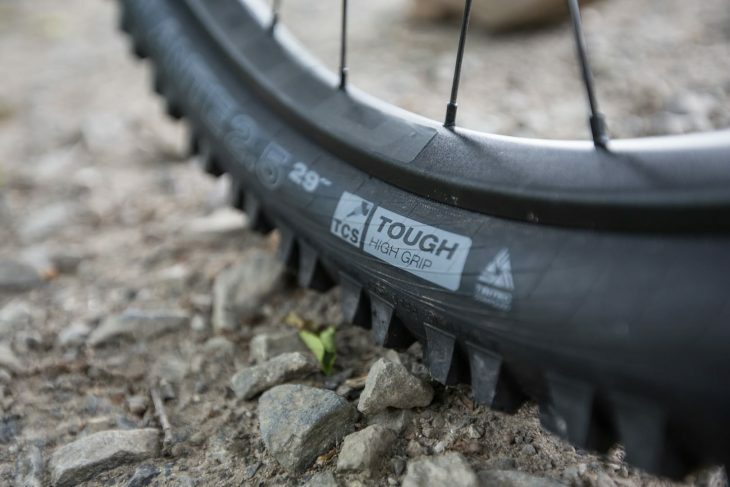 You can get it for both 27.5in and 29in sizes, and with Fast Rolling or High Grip compounds (for when it’s really loose), but this time around it’s the Tough casing option only – you won’t be running a tyre this aggressive when pootling around a trail centre, and you won’t want a puncture to ruin your race run, so there’s no point in trying to compromise. Slash sidewalls are new, and hopefully avoid…slashes to the sidewalls. High Grip TriTec: This features a 65a durometer rubber on the base, 48a in the centre, and 42a outer knobs, which should offer a significant increase in grip over the old, harder compound. Fast Rolling TriTec: This uses the same 65a durometer base, but hardens up to 60a in the centre and 48a on the outer edges, to offer better wear resistance and faster rolling, at the expense of outright grip. The Tough casing option uses a 2-ply construction. Onto the casings, and WTB’s familiar Light and Tough options remain. However, the Light casing now gets the Slash Guard, which is designed to cut out (pun intended) sidewall erm… cuts. In comparison, the Tough casing is much heavier and more robust with a true dual-ply construction. 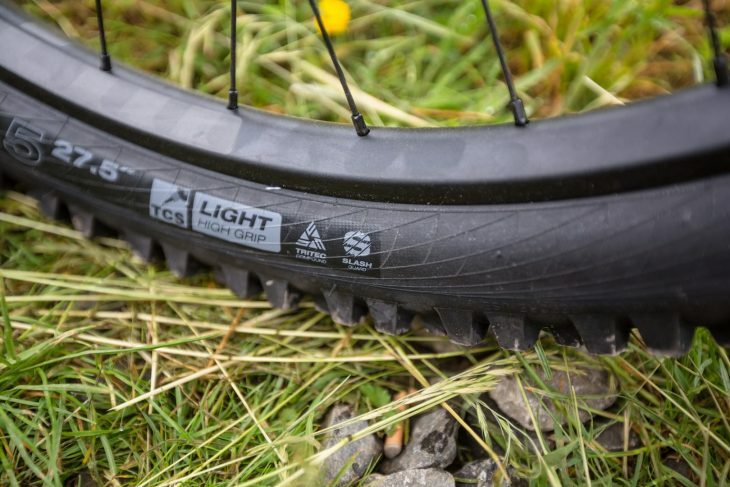 Unusually, while most high end tyres have a high thread count (120tpi) for a more supple casing, WTB are bucking the trend and all these new tyres (both Light and Tough) are only available with a 60tpi casing. 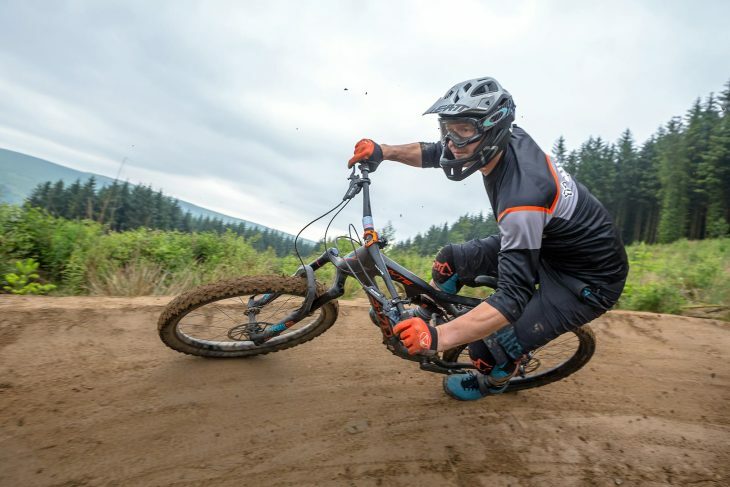 According to Clayton Wangbichler (Public Relations at WTB, and owner of the best last name in the bike industry), the lower thread count makes for a tougher and more supportive casing, both of which are necessary due to the lower pressures we ride at these days. As it was, the pre production samples we rode were only 120tpi, so I can’t exactly comment on these claims right now. WTB has expanded the rim lineup with a new KOM Tough option. 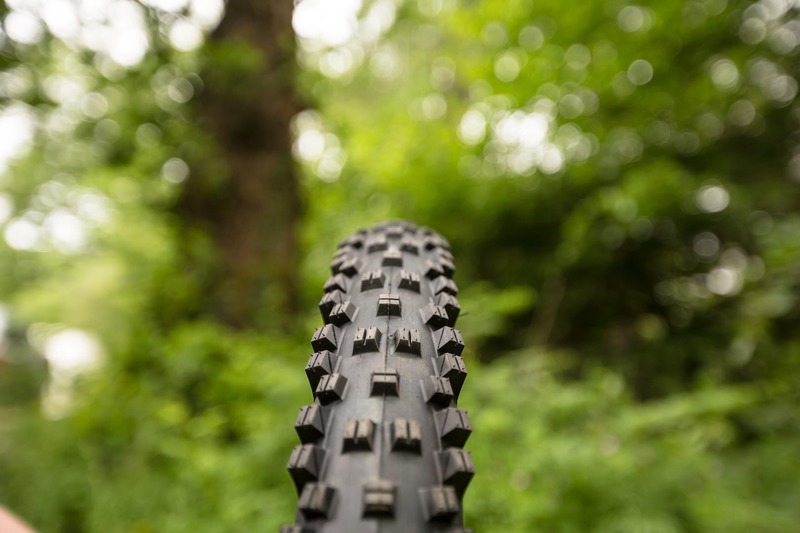 WTB’s original Tubeless Compatible System (TCS, which was introduced back in 2009) was one of the earlier tubeless systems where the tyre and rim came from the same manufacturer. Rims and tyres have gotten a lot wider since then, so it was kinda due for an update. Enter TCS 2.0. The new rims feature a recessed channel along the centre, where the all new Solid-Strip sits and covers the spoke holes to provide a smoother surface for the all new, Flex Tape to cover. The rims also feature WTB’s On-Ramp, which helps tubeless installation and inflation on wider rims. Having struggled to install WTB tyres in the past, I can attest that this is a massive improvement on the old system, and the tyres popped on and off the rim with ease. That’s a lot of new rims! WTB now uses the Solid Strip, which sits in the middle of the rim channel to cover the spoke holes. Tubeless tape goes over the top of this. 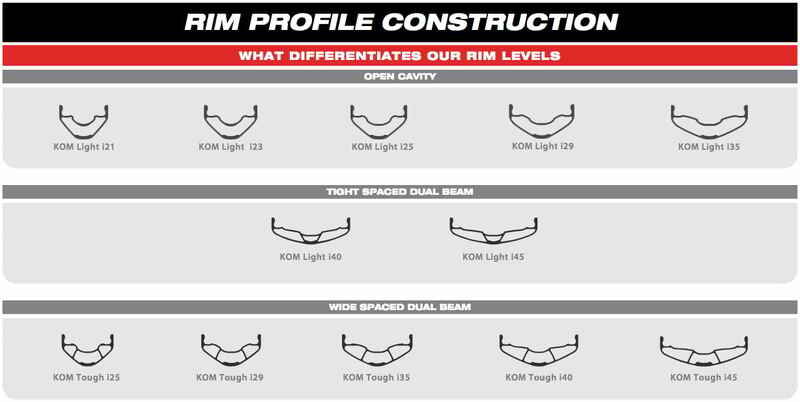 The rims themselves are now split into two categories – KOM Light, and KOM Tough. With a lighter, open cavity construction, the KOM Light rims are narrower and are designed for gravel, cyclocross, XC and trail riding. 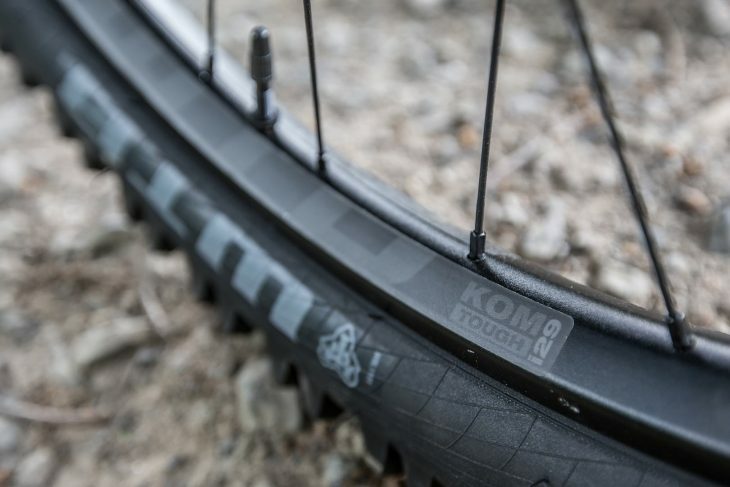 The KOM Tough rims are wider with a dual beam construction and are designed for the burlier end of the riding spectrum – think trail, enduro and gravity disciplines. The other difference is that KOM Tough are 27.5in and 29in only, whereas KOM Light rims are available in a 26in size as well. James went well and truly endoooooro to test out the new WTB tyres and rims at Bikepark Wales. 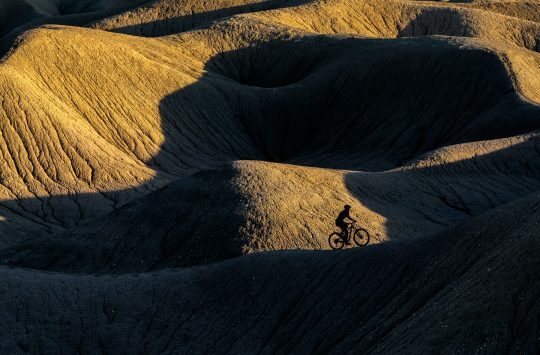 So how does it all ride? Well, over the two days at BikePark Wales, I spent most of my time riding a Vigilante Tough High Grip 2.5in up front, and a Judge Tough Fast Rolling 2.4in at the rear. 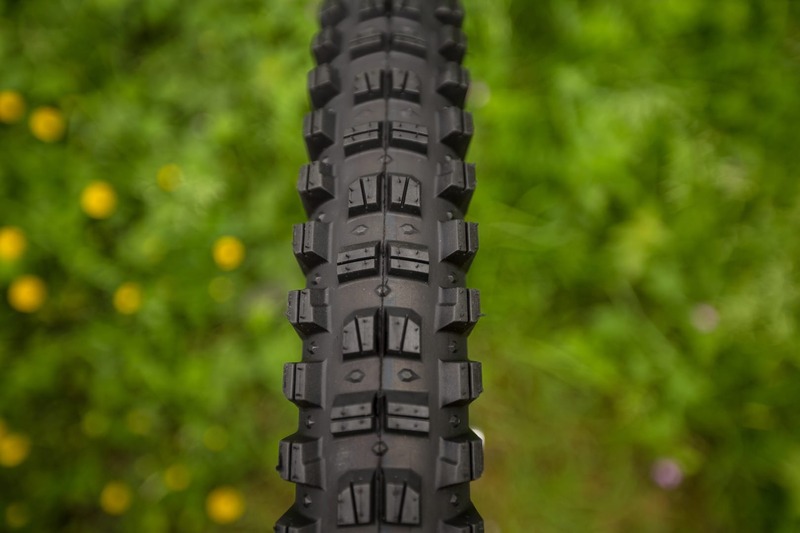 On an unfamiliar bike (a Whyte G170), in relatively dry conditions and on unfamiliar trails, I can’t say that I properly tested the tyres to their limit. I tested the older model last summer so I’m familiar with how the Vigilante rides. With it’s softer compound and more pronounced side knobs, the new Vigilante definitely feels like an improvement and I’m looking forward to getting some more riding time on them. 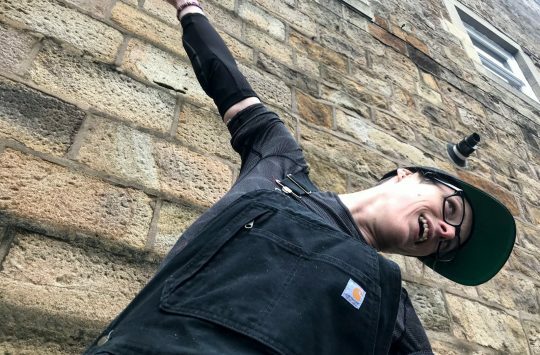 We didn’t really get to test out the tyre’s climbing speed or rolling resistance , since we spent the whole time being uplifted, and barely had to turn a pedal in anger. From what little pedalling I did have to do, neither the Vigilante or Judge felt overly draggy, and I had no issues getting up to speed at the start of my runs. Up front is the new 2.5in Vigilante, and out back is the all-new 2.4in Judge. 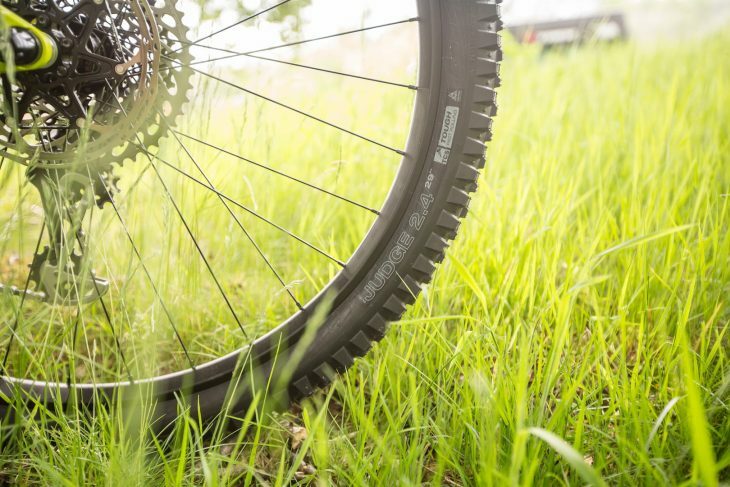 We were initially set up at 22psi front, and 24psi at the rear, but WTBs claims of tougher, more supportive sidewall were borne out, and we soon dropped to about 20psi at the front and 22psi at the back to take some of the sting out of the trails. With this reduced pressure, the tyres still held up exceptionally well on the perfectly sculpted berms and jumps of BikePark Wales, until I managed to put a couple of rather tasty dings into my rear rim on one run down the appropriately named Rim Dinger, resulting in a flat tyre and necessitating a new rear wheel. In my defence, it was towards the end of the day, I was tired and my line choice was definitely getting a bit suspect! James managed to destroy a rear wheel and tyre. All in the name of testing eh? I’ve only had limited time aboard the new WTB tyres, so there’s only so much I can say about their performance. That said, the changes to the Vigilante and Trail Boss’ tread patterns do feel like a genuine improvement, and I’m looking forward to getting them onto a wider variety of terrain to really test them out. What I can say now is that the new TCS 2.0 system works very well, and is a welcome improvement over the previous tyre’s ability to be setup tubeless. Along with the two casings, the two compound options, and the new wider tyre sizes, WTB is covering a broad spectrum with its revamped tyre lineup. 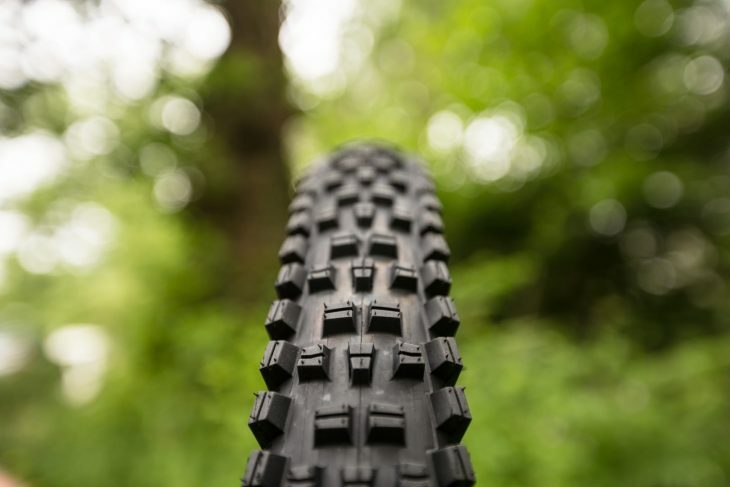 We’ll be getting some of the new WTB tyres in soon for longer term testing, though you can head to the WTB website for more info in the meantime. 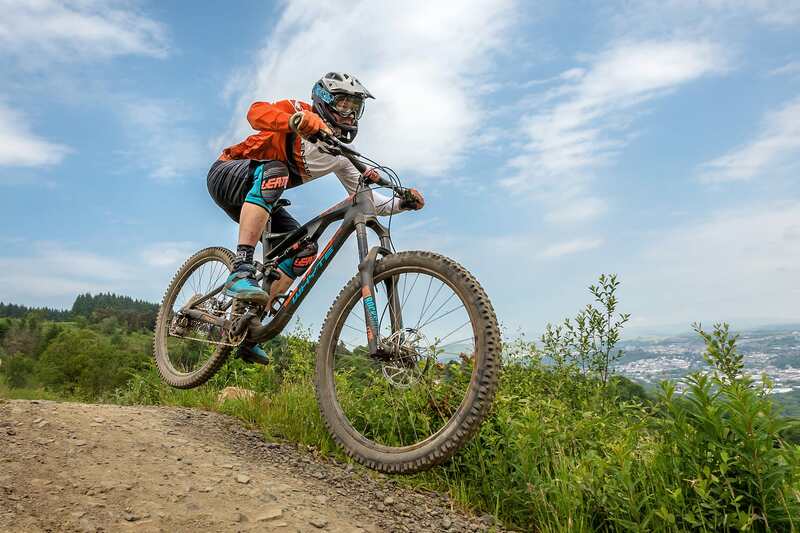 GT Bikes' brand new Force and Sensor, and the return of LTS - but not as you know it!